There's something very wrong about pulsar SXP 1062. 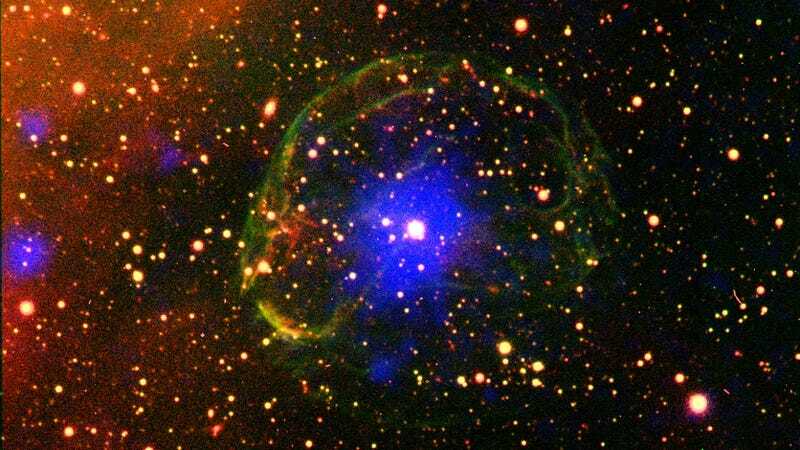 This neutron star was created in the aftermath of a massive supernova. All the evidence says this star formed 40,000 years ago...but its slow spinning tells a far different, much older story. When massive stars go supernova, two things can happen to their remnants. If they are dense enough, they will collapse into a singularity and form a black hole. But for slightly less massive stars, the end result is a neutron star, where all the protons and electrons actually get compacted together to form a star that's mere miles across, and made up purely of neutrons. Because angular momentum is conserved, the tiny neutron star has to rotate incredibly rapidly to match the original giant star. This gives rise to fast-spinning stars known as pulsars, because their rotation maks the light they emit appear to pulse at regular intervals. So that brings up to SXP 1062, which is found in the Small Magellanic Cloud, one of the satellite galaxies of our own Milky Way. Two sets of astronomers have studied the supernova remnants and determined that this pulsar's giant predecessor must have exploded relatively recently, between 10,000 and 40,000 years ago at most. That's almost nothing on a cosmic scale, and it should mean that the pulsar is still spinning extremely rapidly. And that's the problem - the exact opposite is actually true. SXP 1062 is one of the slowest spinning pulsars ever observed, completing a rotation only once every eighteen minutes. Until now, the only known way to get a pulsar spinning that slowly was for it to decelerate with age. But that would mean the star is much, much older than 40,000 years, somehow implying that this pulsar formed before the original star exploded. Of course, that's a complete paradox, and much as it would be awesome to find out we're looking at some sort of bizarre, time-hopping pulsar, that has to be considered the least likely option. Still, there's no known explanation for what's going on here. Somehow, this pulsar was either born spinning much more slowly than normal, or something caused it to decelerate at an incredible rate. Either possibility would represent a previously unknown cosmic phenomenon, and the astronomers hope that the X-ray observation data will soon reveal the truth of this comic enigma.